Looking at this blog titled - "School Re-formed" and particularly at the article that describes a unique learning program - "Shikhantar and Swaraj", it seems to ring a bell on alternative education very loudly for learners today. If you want pure learning without worrying about - exams, peer pressure, learning disabilities, high expectations, this seems to be a real-life example of how its done. Read through the entire article, to understand how some of life lessons are learnt through experiences as a khoji ! What does “school” look like when we throw out the grades, the classes, the teachers (the competition, the tests, the authority from above)? 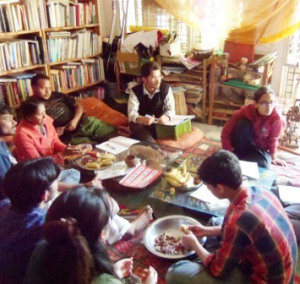 This one-of-a-kind organization in India offers a compelling picture for what learning could be. Kudos to the founders & visionaries, for having started Swaraj and Shikshantar. Do check out the blog which documents the learnings & doings of Khojis/Students online. If you are contemplating a Gap year and want to do something you are passionate about, there is nothing like trying something with such organizations ! Can we have more such organizations like these in 2013 please ?